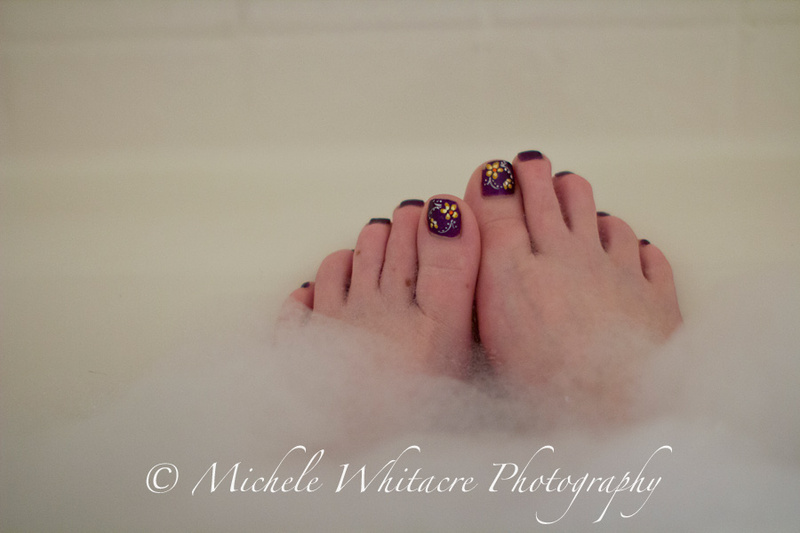 April's self-portrait was once again taken at our rental house in Phoenix, and it is obviously a photo of my feet while I am relaxing in a bubble bath. The irony of this photo is rather amusing to me, as 10-15 years ago I NEVER would have posted this photo for the world to see. I never would have even taken the photo! I used to be so self-conscious of my feet that I refused to wear anything but closed toe shoes. Obviously a lot has changed over the years, but I supposed that is to be expected. One of the great things about getting older is that most of us learn to accept ourselves more as time goes on. I chose this as my photo for the month for a couple of reasons. First, it is impossible for me to look at my purple painted toes with the cute flowers without smiling and feeling happy, and April has been all about happiness for me! I started a new day job at the beginning of the month that I am really liking, and I opened my shooting schedule up and began booking a few sessions. I also decided to go back to working my day job 4 days a week, which has brought a balance back into my life that has been missing for a very long time. I finally feel like my life is back in a good place. Second, a large part of my month has been consumed with planning the details of a trip we are taking to Hawaii, and the flowers on my toes reminds me of the flowers found in tropical places. So the photo also represents all the plans I've been making for my upcoming vacation. I will admit that this month's photo was nice and easy to take since I could just hold the camera and shoot, but I spent the entire time terrified that I was going to drop my camera into the water. I had a death grip on it the entire time! Ah....LOVE your April self portrait and post. You deserve all the happiness that is finally coming your way!